I finally get to watch Cinderella after waiting patiently since it came out last Thursday. It wasn't really a good timing to watch during working days so I tried to suppress my excitement until the weekend. Coincidentally I attended an amazing event on Saturday with The Butterfly Project Malaysia so after the event ended, I went to get the tickets for me to watch the movie on the next day. Wondering what is the fun filled event I attended? Stay tuned for another blog post that will be filled with colours! On the day, we actually arrived at GSC at the last minute as they was no available parking space in One Utama (OU) and we ended up circling around quite a few times. *sigh* I really have no luck with OU parking, the last time I went there with a car for a company dinner we ended up looking for a parking for two hours! After getting some popcorn we rushed into the hall and find ourselves just in time for the highly anticipated Frozen short film. 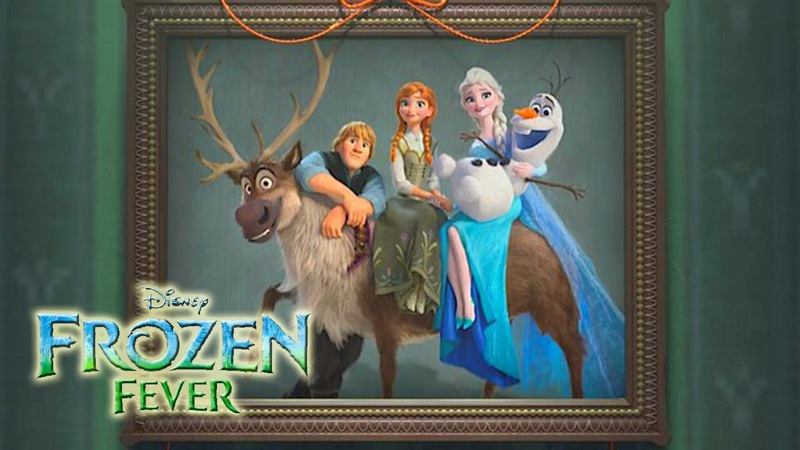 Thankfully the short film is not disappointing and I had quite a laugh watching the cuteness of Olaf, Kristoff and Elsa trying to throw Anna the best birthday party ever! The twist in it is that something happened to Elsa that was about to ruin the party. But Anna being the kind sister ever kept on being kind and everything ends well. If you wonder what happened to Elsa, you really should go and watch it. The new song in the short film is a fun one too! That is the main theme of Cinderella as we all know it and the Hollywood version of Cinderella emphasized it enough through out the film especially when Cinderella's mother wish on her death bed was for Ella to always be courageous and kind. This movie does not stray from the classic Cinderella storyline and what amazed me as I was watching is that no matter how well we know the story, watching the movie is not boring at all. In this Cinderella movie, it tells story about Ella who was born as the only daughter of a merchant and his wife. She was loved by everyone because she is so kind not only to people but also animals. But unexpectedly her mother fell sick and passed away not long after that. Ella grows up with her merchant father who sometimes travel for a long period of time while leaving Ella attending their home. One day, Ella's father express his wish to find happiness one last time and asked for Ella permission to remarry. Being the gentle and kind Ella she happily support him although deep in her heart she does feel sad over her father's decision. Fast forward, her new step mother and two step sisters arrived in their home and Ella tried to please them but the three of them always ignore her. Soon after that, her father decided to travel for business for a few months, he asked his new step daughters for their wishes along with Ella's. Unlike the sisters who asked for parasol and lace, Ella only want her father to bring back the first branch that bushed over her father's shoulder. She told her she wanted that so her father will remember her always as he keep the branch through out his journey. But dark clouds are still hanging over Ella's life when, one day she received news of her father's death during the journey. After that day, Ella step mother and step sisters started treating her as their real servant and ended up calling her with a new nickname, Cinderella. One day Cinderella got too upset over their harsh treatment and went away into the jungle riding a horse. Her fate with the prince crossed that day as they met in the jungle while he was hunting. After a few exchange of conversations, the prince left but he couldn't seem to forget Cinderella. And then you all know what happened, the fairy godmother appeared, the first dance with the price, the clock strikes midnight and the happily ever after. But even with all the familiar storyline, I still shed tears on some scenes and got mesmerized during the fairy godmother scenes. One of the best part is to see the glass slippers get materialized in real life and see the beautiful Cinderella gown along with the amazing pumpkin carriage. In overall, I give this movie a 4.7 out of 5 because they are some parts where I feel Lily James acting as Cinderella seemed a bit too much. But she did a great job in overall so I think I shouldn't judge the whole story based on just one or two awkward scenes. It was amazing to see the story I listened to in my childhood days got turned into an amazing movie. I wonder if they actually sells the glass slippers? I'm just kidding! Or maybe not?